“Eisenhower: The White House Years” was published in 2011 and is Jim Newton’s second biography. His first, covering former Chief Justice Earl Warren, was published in 2006. Newton is a journalist who has worked at The New York Times, The Atlanta Constitution and The Los Angeles Times. He recently moved to UCLA where he teaches and serves as Editor-in-Chief of a school magazine which he helped launch. 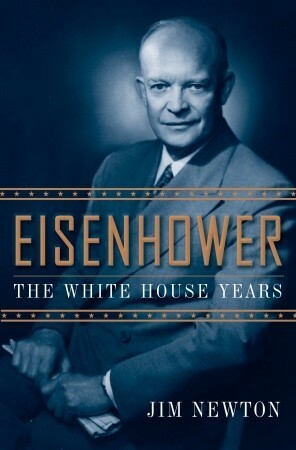 Although its title suggests a singular focus on Eisenhower’s eight-year tenure in the White House this 357-page biography is surprisingly broad in coverage, focusing with varying degrees of scrutiny on his entire life. Nevertheless, with nearly three-fourths of the text dedicated to his two-term presidency, this is not a perfect substitute for a more traditional, comprehensive biography of Eisenhower. Newton’s background as a reporter and editor is not surprising; his narrative is remarkably coherent, impactful and unpretentious. And despite the Eisenhower presidency’s lack of breathless drama, the story line is always clear and often captivating. Only Newton’s occasional tendency in early chapters to jump around the timeline may lead to some confusion. Fortunately for the reader, however, there are countless instances throughout the book of articulate and keenly interesting discussions of events which, in many other texts, are dull or confusing. And in other cases Newton simply does a much better than average job explaining complicated events in an exceptionally comprehensible manner. The back-story Newton provides relating to Eisenhower’s decision to seek the Republican nomination in 1952 is the most colorful behind-the-scenes account of those months I’ve read. And his review of the the 1952 presidential campaign itself is easily the most engaging I’ve come across. Covert actions authorized in the early 1950s by President Eisenhower in Iran and Guatemala, which are relatively hard to follow in many other biographies, are presented with remarkable lucidity. Also particularly well-described are Eisenhower’s (lack of) engagement with Senator Joe McCarthy and Chief Justice Earl Warren’s masterful maneuvering to achieve a unanimous decision in the landmark Brown v. Board of Education. But for all its shining moments this is not quite a perfect biography of Eisenhower. Despite receiving competent coverage, the six momentous decades preceding his presidency are surveyed in fewer than fifty pages. And, occasionally, the discussions of his actions as president leave the reader feeling as though the narrative has merely skimmed the tree-tops – that the messy details have been left aside (often because that is the case). But many readers will see that as a small price to pay for clarity and efficiency. Overall, Jim Newton’s “Eisenhower: The White House Years” does an excellent job fulfilling its core mission of examining the Eisenhower presidency in an interesting and comprehensible manner. But because it does not provide thorough coverage of Eisenhower’s pre-presidency, for readers seeking to understand the “whole” Eisenhower this book is most valuable as a supplemental text read in conjunction with a traditional, comprehensive biography. It’s interesting that you read several books on the same subject – a particular man’s life and his time served in the most important office in the world – and come away with a different take on it. I wonder if it is due to the author’s intentions, his/her strength and weaknesses as a writer, or the results of the editing process. Or a combination of the three? I just wonder what you think makes for a great presidential biography? I think the ability to read several bios of one person and come away with distinctly different perspectives (though they usually share much as well) has to do with everything you cite: an author’s bias, writing style, the sources available to the author, time that has passed since the presidency (and the ability to see it and its effects more clearly), etc. I really think that reading almost anything about history requires more than one book. As you say, different authors have distinctly different takes. For example, Newton’s take on Eisenhower’s handling of the Cold War is largely positive, others not so much. While I liked the book, I thought that Newton failed to address sufficiently several issues that have come up in recent historiography about Eisenhower’s presidency, specifically, the consequences of covert action (which Newton acknowledges but does not go into detail) and whether Ike missed chances for reducing Cold War tensions after Stalin’s death. I think that’s true of most presidential bios and, indeed, of history generally. Did you realize that your grandmother campaigned for Eisenhower?